You got the car you wanted, now it needs just that little something to "set it off"! 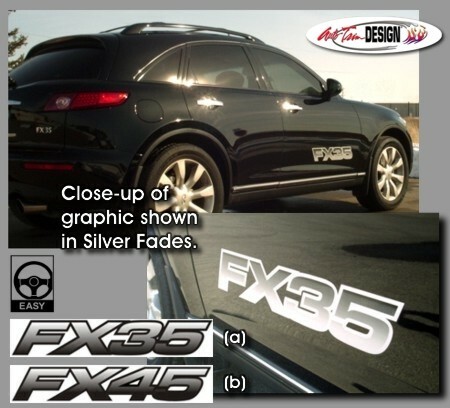 Dress it up with these awesome body side graphics for either the FX35 or FX45. Available in one of three (3) color schemes - Silver (shown), Gold or Black Fades and is individually packaged with one (1) Driver Side and one (1) Passenger side graphic. Looks Great and easy to follow general online application and care instructions are included.